New York City, March 1, 2006 - The Ukrainian Museum is commemorating the 20th anniversary of the Chornobyl nuclear power plant disaster with a major multi-media exhibition that explores the accident's impact on the lives of residents in the territories of Ukraine most heavily contaminated by radioactive fallout. Entitled Chornobyl + 20: This Is Our Land … We Still Live Here, the exhibition includes approximately 175 color photographs with accompanying captions. Supplementing the photographs are other visual materials - maps, charts, text panels - that place the accident in its historical context, describe the actions subsequently taken by authorities to mitigate the disaster (such as the relocation of area residents), and provide detailed information about population shifts, levels of radiation, and the like. The exhibition opens to the public on March 12 and continues through May 28. An important component of the exhibition is an interactive audiovisual program consisting of 14 film clips, each about a minute long. The visitor-activated clips include interviews with residents of the irradiated territories, views of the landscape, a religious holiday celebration, and musical performances and craft demonstrations by residents. 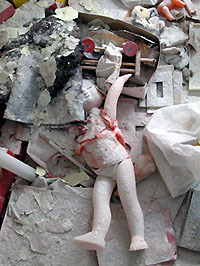 The Chornobyl disaster began on April 26, 1986, when the worst nuclear power plant accident in history resulted in a partial meltdown of the core in reactor No. 4 at the Chornobyl Atomic Energy Station just outside the city of Pryp'yat in what was then the Ukrainian Soviet Socialist Republic. Over the next decade, more than 160 villages were evacuated; more than 160,000 residents were permanently resettled; and thousands of other families, many with young children, voluntarily left the irradiated regions. Nevertheless, more than one million people - nearly 70% of them elderly pensioners - continue to live in contaminated areas of Ukraine, notes Professor Myron Stachiw, co-curator of Chornobyl + 20. Among them are several hundred mostly elderly former residents of the heavily irradiated 30-km Exclusion Zone around the reactor. "They have returned to their homes to live out their remaining days in familiar surroundings," he adds, "sometimes alone in their villages, often under conditions closer to the 18th century, largely forsaken by the 21st." Chornobyl + 20: This Is Our Land … We Still Live Here chronicles the lives of people who, twenty years after the accident, make their homes within the "dead" (forcibly evacuated) villages of the 30-km Exclusion Zone, as well as those who still reside in the unevacuated villages that authorities deem "safe" enough to inhabit. 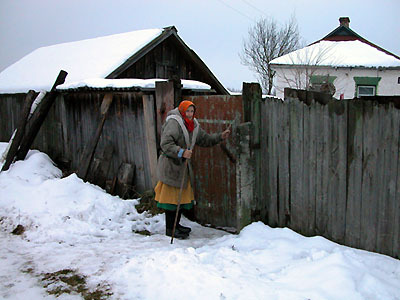 Since 1994, Ukrainian scholars have worked to document and preserve the archaic and unique traditional culture of Polissia, the region of Ukraine most heavily irradiated in the disaster. This act of "cultural rescue" is unprecedented in its scale and scope in modern history. The photographs and video clips in this exhibition, taken during ethnographic expeditions in 2004 and 2005, show the people, their daily lives, and the places where they live and work; they also document the work of the expeditions. The film clips (all with English subtitles) tie in directly to the photographs. They include interviews with residents of both "dead" and "safe" villages, show craftspeople at work and traditional songs performed by residents, and present images of the irradiated territories, focusing on the homes and gardens of residents. One interesting effect of the collapse of the economy in the irradiated regions, including the system of collective farms, is the disappearance of most mechanized agricultural technology. As a result, residents are returning to oxen and horses for transport and motive power to plow, cultivate, and harvest their crops; grain is more often threshed with a flail than with a combine; and nearly forgotten arts like blacksmithing, coopering, and basketweaving are staging a comeback. The photographs and videos in this exhibition are the work of co-curators Myron O. Stachiw of East Woodstock, Connecticut, and Serhiy M. Marchenko of Kyiv, Ukraine. The exhibition was designed by Alfredo Maul of Maul Dwellings, S.L., San Sebastian, Spain. Myron O. Stachiw is an associate professor of historic preservation in the School of Architecture, Art and Historic Preservation, Roger Williams University, Bristol, Rhode Island. He is currently in his second year as a Fulbright Fellow in Ukraine, where he is studying the impact of the Chornobyl disaster on the cultural heritage of the country's irradiated territories. Professor Stachiw is also producing a documentary film on the continuing efforts of Ukrainian scholars to document and preserve the traditional culture of the Polissia region, which has been identified by scholars as containing the most archaic surviving cultural traditions of any part of Ukraine. Serhiy M. Marchenko is a Ukrainian filmmaker and photographer living in Kyiv. Since the early 1990s, he has been involved in photographing and filming life in the Chornobyl Exclusion Zone as well as the efforts of Ukrainian scholars to rescue the region's traditional culture. The photographs and films in this exhibition are the product of the curators' participation in two ethnographic expeditions with Ukrainian scholars and several additional journeys into the irradiated territories between August 2004 and December 2005. 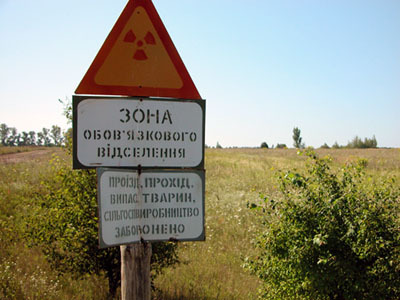 Chornobyl + 20: This Is Our Land … We Still Live Here is sponsored by Self Reliance New York Federal Credit Union. The Ukrainian Museum is committed to acquiring, preserving, exhibiting, and interpreting articles of artistic or historic significance to the rich cultural heritage of Americans of Ukrainian descent. At its founding in 1976 by the Ukrainian National Women's League of America, the Museum was hailed as one of the finest achievements of Ukrainian Americans; in the three decades since then, it has become known as one of the most interesting and dynamic smaller museums in New York City. Each year, the Museum organizes several exhibitions, publishes a number of bilingual catalogues, and conducts a wide range of public programming, frequently in collaboration with other museums, educational institutions, and cultural centers. In the spring of 2005 the Museum moved into a brand-new, state-of-the-art facility in the heart of Manhattan's vibrant East Village. The new Museum building was designed by the Ukrainian American architect George Sawicki of Sawicki Tarella Architecture + Design in New York City; it was funded thanks to scores of donations, large and small, from the Ukrainian American community, including exceptionally generous gifts from Eugene and Daymel Shklar and Self Reliance New York Federal Credit Union. The Museum's new home, with spacious galleries and facilities for public programming, allows it to mount more elaborate exhibitions, to accommodate more visitors, and to preserve and showcase its growing collections of folk art, fine art, and archival treasures. Museum hours: Wednesday-Sunday 11:30 a.m.-5:00 p.m.